Not all dogs love to swim, but for those who do, nothing puts a sparkle in the eye and a catapult in the step like the sight of a big blue lake, a stretch of beach with its fascinating surf, a pristine swimming pool, a muddy pond, a plastic kiddy pool, or a really big puddle. Even a freshly filled water bowl tips some dogs into ecstasy—if this is your dog, then you know exactly what I’m talking about. 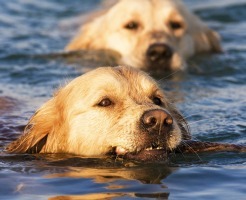 Swimming is great exercise for dogs who enjoy it, and it’s also an excellent way to help retrievers and other dogs exercise their natural instincts. But the splash factor can wreck your dog’s beautiful coat in several ways. Here’s how good grooming can head off the damage so your dog won’t miss out on all the summer fun. Chlorine dries out human hair and skin, and dogs aren’t immune either. Dogs who take frequent dips in the family pool may suffer from dry, itchy skin and a dry, dull coat because the chemicals in pool water strip the skin and coat of their natural oils. Chlorinated water may also have a slight bleaching effect on dark coats, and could even turn lighter coats (gasp!) greenish. To avoid these nasty side effects without banning your eager retriever from the pool (as if that would work), do just three simple things. During pool season, spray your dog’s coat with coat conditioner before he goes into the pool. This will help protect skin and coat from drying. If you can find one that also contains sunscreen, all the better (because dogs can get skin cancer, too). After every swim—or at the end of each day, if your dog tends to jump in and out of the pool all day—rinse his coat thoroughly with cool water. Rinse longer than you think is necessary to remove all the chlorine and other pool chemicals. Towel-dry or blow-dry if appropriate. If your dog has a medium or long coat, follow the rinse with another spray of coat conditioner and a swipe-through with a comb. Get all the way down to the skin mats can hide, and when they dry they’ll get tighter. Missing one for even a day during the summer can result in a knotty problem. Once each week during swim season, comb out all tangles and bathe him thoroughly with a gentle moisturizing shampoo and conditioner that will rid the coat of chlorine residue and restore moisture to a dry coat. These three simple steps will make a noticeable difference in the effect chlorinated water will have on your dog’s coat. For good measure, an omega-3 fatty-acid supplement can help replenish natural coat oils from the inside out. If you are lucky enough to live near a dog-friendly beach, then we would like to come visit. But we also know that sun, salt, and sand can create a perfect storm of itching. You can avoid much of the beachy discomfort by adding a few key items to your beach bag: doggy sunscreen, a bristle brush, and an extra towel. Before your dog heads out into the sun, apply a moisturizing sunscreen to protect his skin and coat. After your day in the sun is done, give your dog a thorough brushing to dislodge sand, brushing against the direction of hair growth, and then with it. After you’ve gotten the loose stuff out, take advantage of those beach showers to rinse your dog from head to toe. Work your fingers through his coat to loosen sand and help rinse away salt. Or, if you’d rather have a salty, sandy dog in your backseat than a soaking-wet dog, do it as soon as you get home. If your dog seems itchy after a beach day, you may not have gotten out all the salt or sand. Time for a bath! Try a gentle anti-itch shampoo, such as an oatmeal or aloe shampoo, that will help to soothe irritated skin while dislodging remaining evidence of the seashore. Even if your beach dog doesn’t seem uncomfortable, give him a good thorough shampoo and conditioning with gentle moisturizing products about once a week during beach season. Another consideration for beach dogs: Sand can be harsh on paw pads, so apply a paw-pad balm before and after a day at the beach. For this reason, it’s usually a good idea to give a dog a full-fledged bath after a dip in a lake or river. Comb out any tangled spots, wet the coat very thoroughly, and scrub all the way down to the skin with plenty of shampoo. Restore moisture with a good conditioner. If your dog takes a dip in the lake or river frequently, choose a shampoo without detergents that won’t strip the coat of natural oils so you can shampoo him as often as daily withoutany damage to the skin and coat. Finally, dogs who swim anywhere, anytime, are at risk of ear infection because when water enters the ear canal, it creates the ideal dark, wet environment for bacterial and yeast growth. After a swim, or even a bath, dry the insides of your dog’s ears as well as you can with a towel or cotton balls. This is important for all dogs, but especially for those with floppy ears because the earflap can prevent your dog’s ears from drying out after a swim. Weekly or even monthly application of an ear wash made for dogs can also help keep ears infection-free. Ask your veterinarian if an ear wash would be appropriate for your sassy swimmer. If your dog begins scratching his ears or shakinghis head, or if you see any redness inside the ear canal, give your veterinarian a call. She may want to take a look, and if necessary, prescribe medication to lick the problem. Ear infections are common in dogs and easily resolved, but if they are neglected they can spread deep inside the ear canal and become very painful. Your dog isn’t going to tell you if his ears hurt, so it’s up to you to pay attention to what’s going on in there. All this grooming is a small price to pay to give your dog the immense joy of an all-out swim session. Whether your dog is fetching sticks or refining his water-rescue skills for the highest levels of competition, a few extra minutes pre- and postswim will keep his skin, coat, and ears in great shape, so your summer can go, well, swimmingly. This article is reprinted with permission from AKC familydog. Visit the AKC familydog digital edition. Eve Adamson is the author of more than 40 books, including The Simple Guide to Grooming Your Dog.